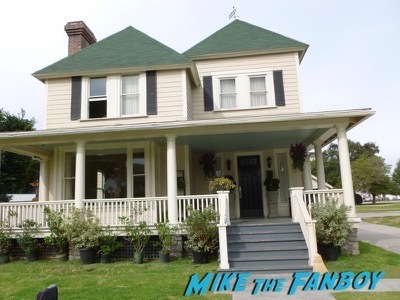 Home / Columns • Featured • Filming Locations • Lindsay / The Definitive Guide To The Warner Bros Ranch! The Filming Location Of Christmas Vacation! Bewitched! I Dream Of Jeannie! Gilmore Girls! And More! One of my favorite people in all the world is going to start writing for MTF! Lindsay, who you may have heard me talk about here, is the filming location guru. If there’s a location to be found, she can do it. Linds mentioned to me that she wanted to do a guest spot like once a month and I was overjoyed. There’s nothing like her recaps, she has so much information to share, it’s incredible. So, for Lindsay’s first foray, we both talked about a place that is fairly elusive to many a mortal, that place is the Warner Bros Ranch. It’s one area of Warner Bros that they don’t do tours and it’s not located on the main lot. It’s very small but so many iconic films and television series have been shot there. I was lucky enough to visit a couple years ago and it was pretty awesome. 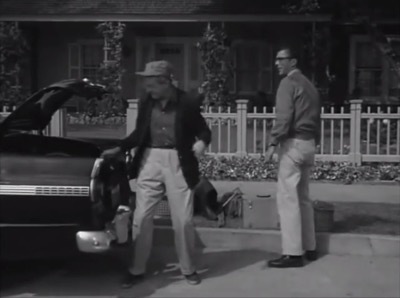 Lindsay was written up the definitive guide to the Warner Bros Ranch and it’s awesome! I’m so excited to share it with you guys. 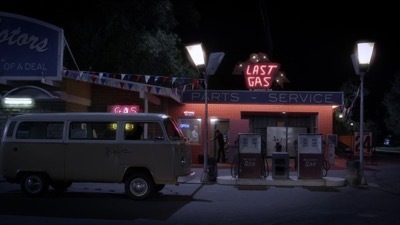 Please make sure and check out Lindsay’s site: www.iamnotastalker.com for everything you’ve ever wanted to know about filming locations and even those elusive places in Los Angeles you never knew existed! It’s a new year and with a new year comes change, growth, opportunity and fresh perspectives. 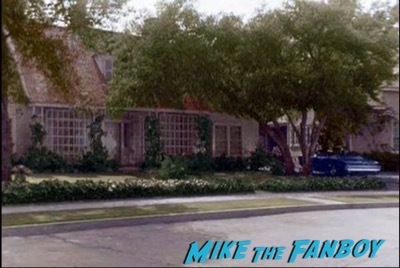 In honor of the season, I recently approached Mikey and asked if I could write a monthly column for his fabulous Mike the Fanboy site. He was nice enough to say yes, so here I am! 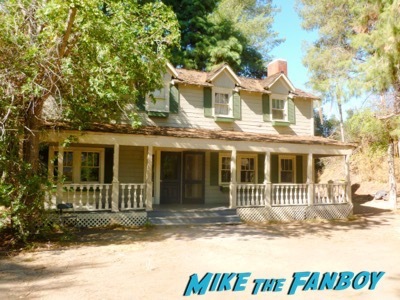 While the two of us were hanging out at the Palm Springs Film Festival a few weeks back, Mikey mentioned that, due to my vast knowledge of filming locations, how fun it would be if the two of us could tour Warner Bros. Ranch together. For those who are not familiar with me or my IAMNOTASTALKER site, I am pretty much a walking/talking guide to filming locations. And, though the Ranch is closed to the public, I have had a few connections there over the years and have been lucky enough to tour it numerous times, so I know its locations in and out. I figured what better way to start out this new venture than by compiling a guide of sorts to the lot. Granted, the Ranch has been captured onscreen hundreds upon thousands of times over the years and chronicling all of its appearances would be virtually impossible. But here is a list of some of the most memorable. Side-note – Mikey always kids me about my penchant for being extremely thorough in my reporting. I apologize in advance for my lack of brevity. Situated in the southern portion of Warner Bros. Ranch, near the main entrance, is a large open expanse of lawn. The 1.6-acre parklike landscape, which is set against a backdrop of picturesque city townhomes, boasts numerous trees and a sparkling central fountain. 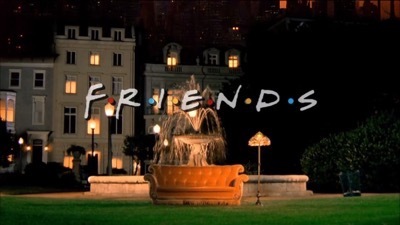 The fountain and townhomes should be most recognizable to Friends fans, as it was famously featured each week in the popular series’ opening credits. Had to do it! On my very first visit the Ranch, the fountain happened to be dry, so I, of course, had to hop inside it to pose for a picture. That was in the days before digital cameras, though, and I am not exactly sure where the photo wound up. During all of my subsequent tours of the lot, the fountain has been full of water, so I have had to make due by posing for photos outside of it. 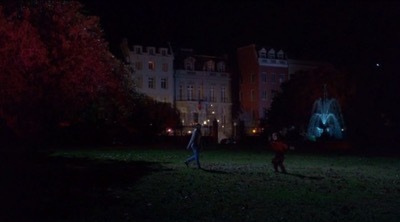 The park and fountain area were also featured briefly in 1993’s Hocus Pocus in the scene in which Max (Omri Katz), Dani (Thora Birch) and Allison (Vinessa Shaw) celebrate after what they believe is a successful attempt at killing the Sanderson sisters. 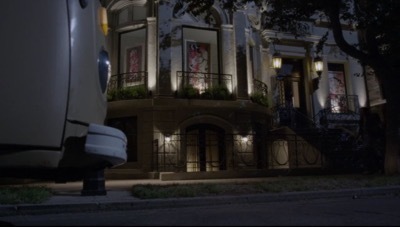 In the Season 5 episode of Pretty Little Liars titled “Pretty Isn’t the Point,” one of the townhouse buildings located just beyond the park masked as the gallery where Spencer Hastings (Troian Bellisario) helped Johnny Raymond (Will Bradley) steal back his graffitied artwork. Positioned surrounding the park is a curved residential street set named Blondie Street. Dotted on Blondie are eleven Anywhere, U.S.A.-style houses. Though all have appeared onscreen at some point, I will just be covering a few of the more notable ones in this post. A two-story clapboard residence known as the Oliver House stands at the Western edge of the street. It was named in honor of the Marge Oliver character from the 1935 movie Party Wire, which was the first movie ever to be lensed at the Ranch. The picturesque pad served as the home of Dennis Mitchell (Jay North) and his family on the 1959 television series Dennis the Menace. As with all of the structures on the lot, the Oliver House has been redesigned numerous times to suit various productions over the years and looks quite a bit different than it did in its early days. 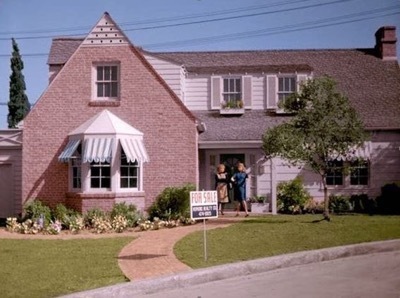 The Oliver House was also the Stone family home on the 1958 television series The Donna Reed Show. 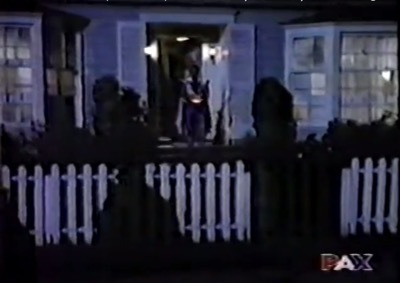 And it was where Karen Sammler (Susanna Thompson) lived on Once and Again, the fabulous 1999 series that is maddeningly not available for streaming anywhere, hence the crappy screen capture below which I got off of YouTube. 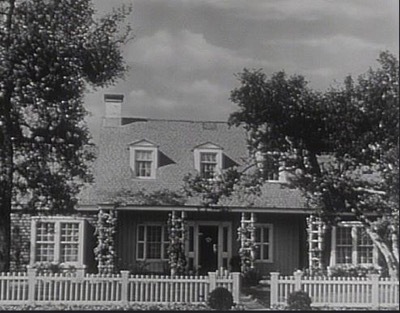 This home, as well as the area of the ranch where it resides, was named in honor of the Blondie films, which made large use of the lot in the 1940s. 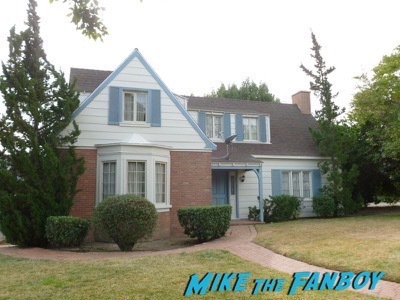 Its original design was actually a replica of a real home located at 4227 Agnes Avenue in Studio City. Unfortunately, that structure was damaged twice in two different fires that took place at the Ranch in 1970 and was later re-constructed. Its current design is largely different than the original. 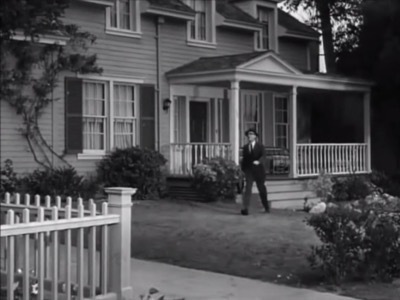 The Blondie House was where the hapless Mr. Wilson (Joseph Kearns) lived in Dennis the Menace. 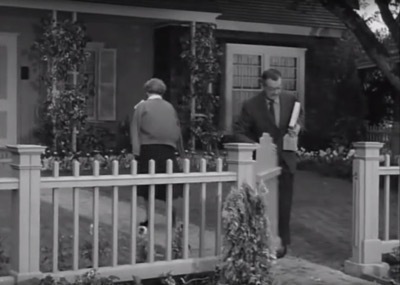 In the iconic 1954 series Father Knows Best, it served as the home of the Anderson family. 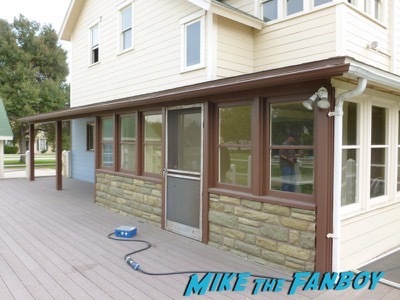 During my first trip to the ranch, I recognized the structure immediately as Major Nelson (Larry Hagman) and Jeannie’s (Barbara Eden) house from I Dream of Jeannie. Fun fact – Jeannie’s bottle is actually a special Jim Beam decanter that was sold during Christmastime in 1964. This home is perhaps one of the most changed on the entire lot. 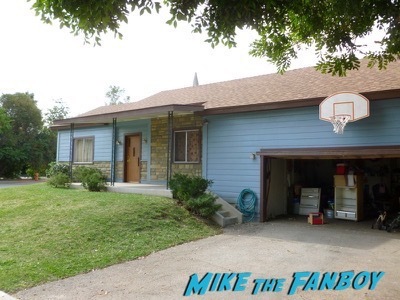 Built in 1953, it rose to considerable fame when it was cast as the home of Shirley, Keith, Laurie, Danny, Tracy, and Chris on The Partridge Family in 1970. 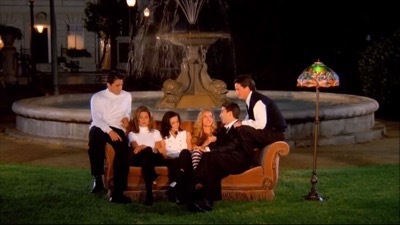 The structure was damaged in a fire that same year, after just a few episodes of the show had been shot, and was subsequently rebuilt for the remainder of the series. It has since gone on to appear in countless other productions and consequently has been altered numerous times. The front is, sadly, no longer recognizable from its Partridge Family stint. Thankfully though, the rear side of the home, which appeared in a few episodes, remains untouched from its Partridge days. 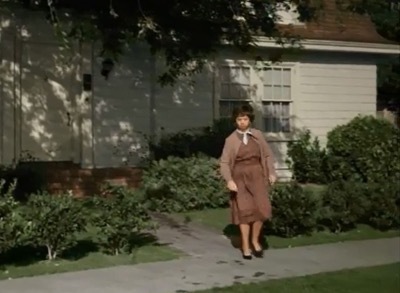 On the television series Bewitched, the Partridge House served as the residence of the nosy Mrs. Kravitz (Alice Pearce). 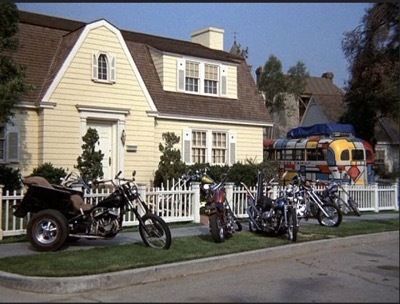 After a significant remodel, it was utilized as the Thatcher home on Life Goes On, one of my all-time favorite television shows. fabulous series that is maddeningly not available to stream anywhere! This ranch-style house is another that has been significantly remodeled since its original construction. 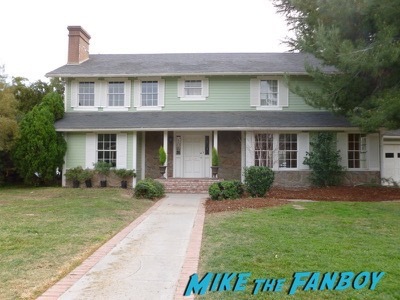 In 1983, it was utilized as Richard Pryor’s home in the comedy Moving. 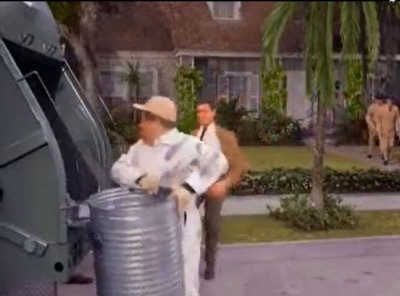 And it made a brief appearance in the background of Christmas Vacation, in the scene in which Clark W. Griswold (Chevy Chase) sawed the roots off of his Christmas tree. 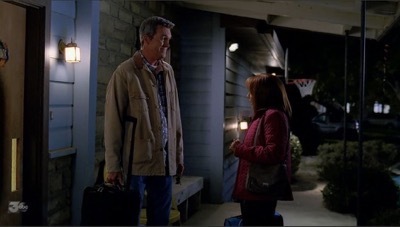 But it is best known for its current role as the residence of the Heck family on the ABC series The Middle. This home was originally built for use in the 1962 television series Our Man Higgins and was modeled after a property located at 267 18th Street in Santa Monica. Interestingly, while the Ranch residence is an almost exact replica of the real home, it was actually built in reverse, so the two structures are, oddly, mirror images of each other. Though it has appeared in quite a few productions, the structure is famous the world over for being the residence of Samantha, Darren and Tabitha Stephens on the television series Bewitched. 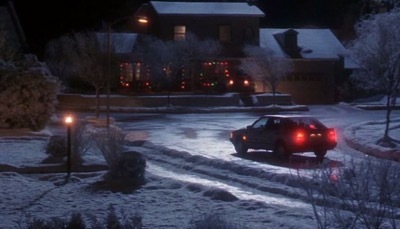 It was also notably used as Clark’s childhood home in Christmas Vacation. 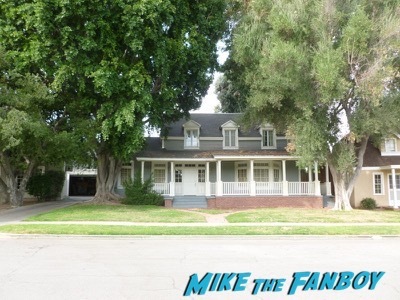 Its most famous appearance was as the Murtaugh residence in the Lethal Weapon films. 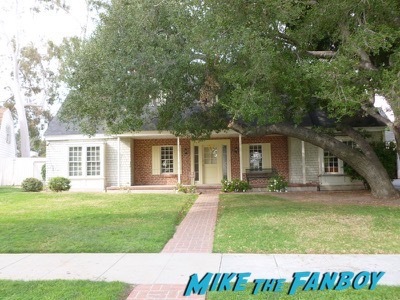 Though the house suffered damage from a toilet bomb in Lethal Weapon 2, in reality it still stands in perfect (though heavily-remodeled) shape on the backlot. The same pad was the site of the party scene at the end of the 2008 comedy Drillbit Taylor. 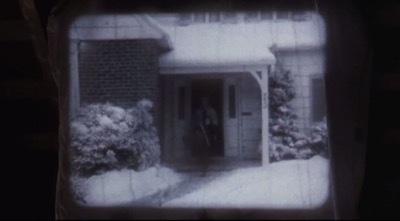 And it was the home of Todd and Margo – and their wet carpet – in Christmas Vacation. This two-story slice of Americana is quite possibly the most famous structure on the lot. 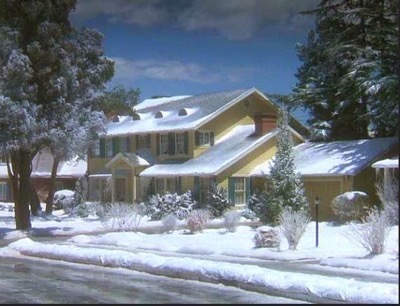 As the name implies, the Griswold House was where the Griswold family lived in National Lampoon’s 1989 hit Christmas Vacation. It is this structure that Clark so famously decorated with 25,000 imported Italian twinkle lights. 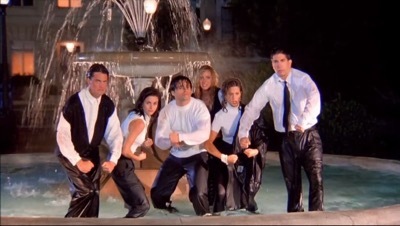 Sadly, it looks much different today than it did when Audrey (Juliette Lewis) and the gang stood outside in their pajamas while awaiting the unveiling of Clark’s magical display. 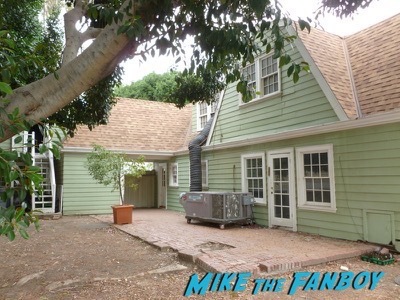 The same structure also served as the abandoned house where Steve Sanders’ (Ian Ziering) Holiday Rave took place – and where Kelly Taylor (Jennie Garth) almost died in a fire while her boyfriend, Brandon Walsh (Jason Priestley), was off cavorting with former flame Emily Valentine (Christine Elise) – in the Season 5 episode of Beverly Hills, 90210 titled “Up in Flames. 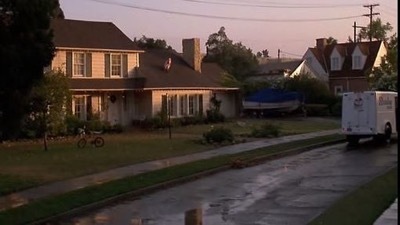 It also popped up in American Beauty as the home of Lester Burnham (Kevin Spacey) and his family. 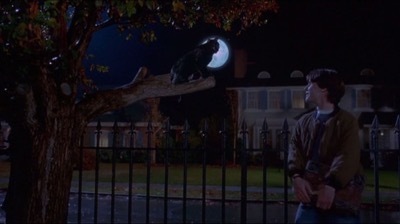 The residence was visible in Hocus Pocus, in the background of the scene in which Binx the cat chatted with Max and told him to always look out for his sister. 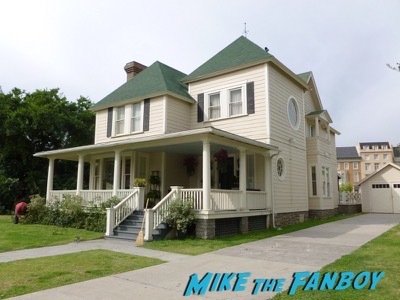 And it was where Lily Manning (Sela Ward) and Rick Sammler (Billy Campbell) lived with their respective children on the television series Once and Again, though I couldn’t find an episode that showed a whole view of the exterior of the house. Blondie Street’s most unique and largest home sits at the eastern edge of the park. A more recent addition to the Ranch, the structure was added in the mid-1990s. 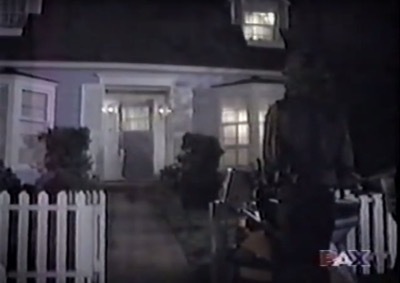 The Alan House was famously used as the residence of Alan Abernathy (Gregory Smith) in the 1998 feature Small Soldiers. 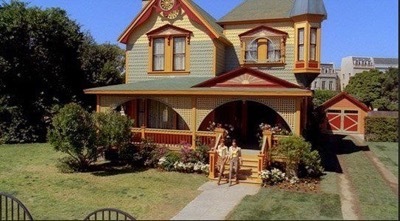 It also popped up as Chuck’s (Anna Friel) childhood home on the television series Pushing Daisies. For that production, the structure was painted in bright colors and featured extensive latticework and therefore looks much different today. 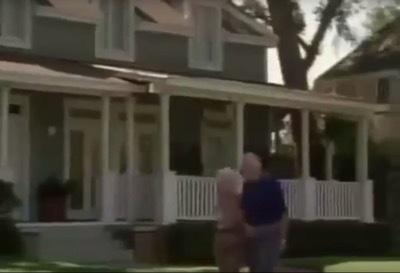 The Alan House and neighboring pool were also used extensively in the movie Project X.
Interestingly, the back side of the structure masks as the rear of the Heck home on The Middle. Though three gas station structures (two of them actual working stations) once stood at the ranch, today only one remains. It is situated at the easternmost end of Blondie Street. 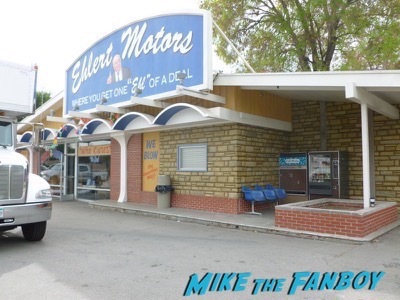 That remaining station is most notably utilized as Ehlert Motors, the used car dealership where Frankie Heck (Patricia Heaton) works on the television series The Middle. As odd as it may seem, a large, non-fenced-in pool sits out in the open in the western section of the park. 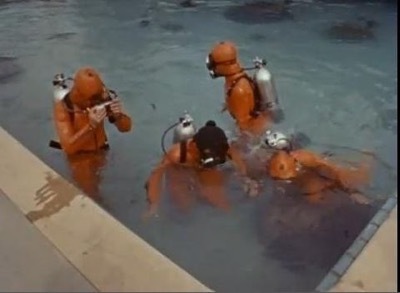 It is an actual working pool that boasts numerous large underground windows that allows for the filming of underwater scenes. 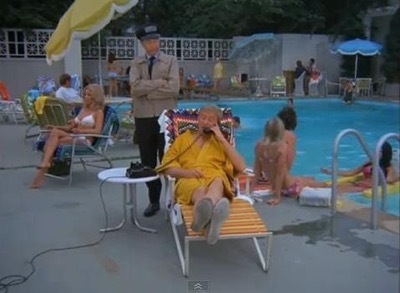 The site most famously appeared in Christmas Vacation as the pool of Clark’s “Mele Kalikimaka”-serenaded dreams. 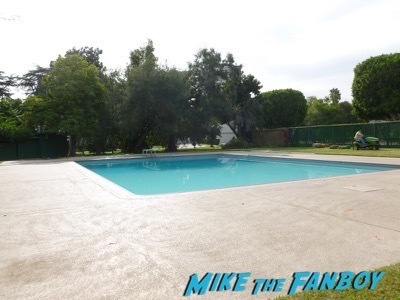 For that production, fencing and shrubbery were added to make it appear as if the pool was located in a suburban backyard. 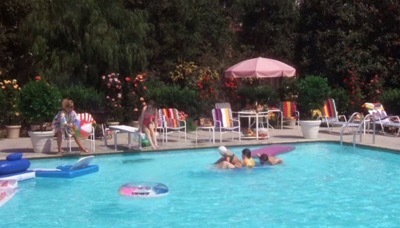 In the Season 6 episode of Pretty Little Liars titled “Don’t Look Now,” the site stood in for the Rosewood Community Pool where Emily Fields (Shay Mitchell) and Sara Harvey (Dre Davis) went swimming. Located in a particularly wooded corner of the ranch is the structure known as the Walton House. It is not the original home used on the popular 1971 series The Waltons. That structure, which originally stood in the Jungle area of the Warner Bros. Studio backlot, was gutted in a fire in 1991. 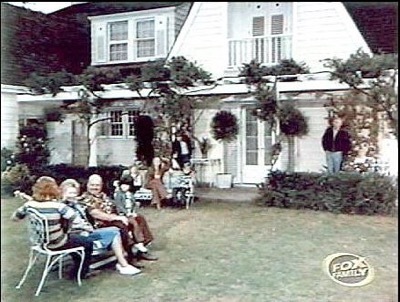 The residence was re-created, again at Warner Bros. 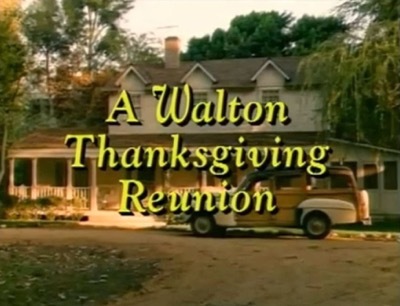 Studio, for the filming of 1993’s A Walton Thanksgiving Reunion. It was finally moved to its current home at the ranch a few years later. 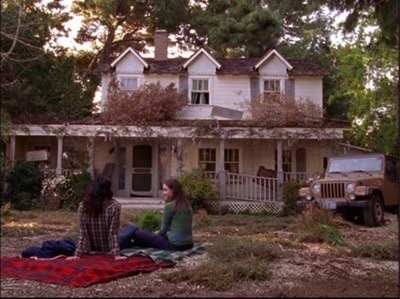 The same residence also regularly appeared as the Dragonfly Inn on the television series Gilmore Girls. I hope you all have enjoyed this “tour” of the Ranch and that it can act as a guide if you ever happen to visit the lot yourself. 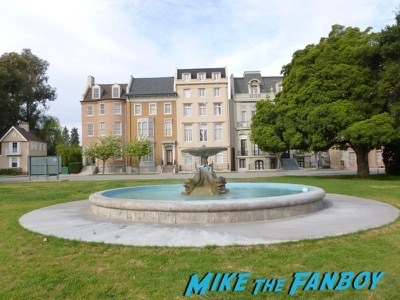 For those interested in learning more about the history of the property and the many filmings that have taken place there, I highly recommend checking out the book Warner Bros.: Hollywood’s Ultimate Backlot, as well as the websites 1164 Morning Glory Circle and the Unofficial Columbia Ranch Site. And of course check out Lindsay’s site: www.iamnotastalker.com She is the definitive guide to filming locations and all around awesomeness. If you’re looking to visit a location, I’m sure she knows where it is! Great article! How interesting all the films shot at the ranch! Glad your writing for the website! Looking forward to much much more. This is wonderful. 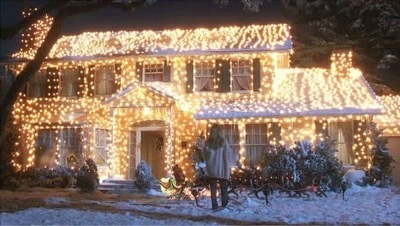 Do you know is the Griswold house specifically built for the film? Thanks PS, Janet and Kayla! 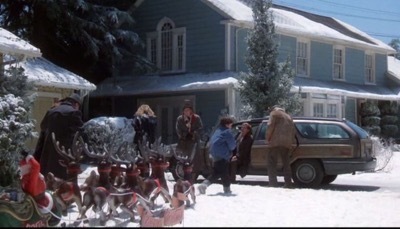 🙂 And yes, Kayla, the Griswold house was built specifically for the filming of “Christmas Vacation.” Prior to that time, a mansion-like structure known as the Deeds House was located where the Griswold facade now stands. It was torn down in 1989 and the Griswold home and the one next to it, known as the Chester house, were built in its place.